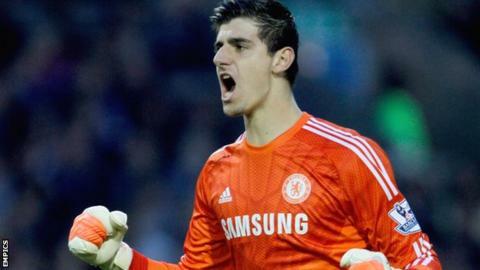 Thibaut Courtois signed for Chelsea in 2011 but only made his debut last month. Chelsea goalkeeper Thibaut Courtois has signed a new five-year contract with the club after displacing Petr Cech as manager Jose Mourinho's first-choice. The 22-year-old returned to Stamford Bridge in the summer after three seasons out on loan at Atletico Madrid and has played in all three Premier League games so far. He said: "My future was already sorted but it's nice to know I'm going to be here for another five years. "Now I can concentrate on playing." Courtois - who was in goal for Belgium during the World Cup in Brazil - joined Chelsea from Belgian side Genk in 2011. In three years at Atletico he won La Liga, the Copa del Rey and the Europa League, as well as reaching last season's Champions League final, but had to wait until last month to make his Blues debut. Cech, 32, had been the Blues' first-choice keeper since joining in 2004 but Mourinho decided to start the season with the younger Courtois. Mourinho said both players are "two of the three best goalkeepers in the world".